The symptoms associated with chronic sinusitis can severely impact quality of life. Many of these symptoms can be caused by improper sinus drainage, because the sinus openings are either too small, or they are blocked. If your symptoms are difficult to control with medications alone, your doctor may recommend surgery to improve sinus drainage. After examination by your Houston ENT Doctor, you may both decide the Balloon Dilation is a good option for your treatment. 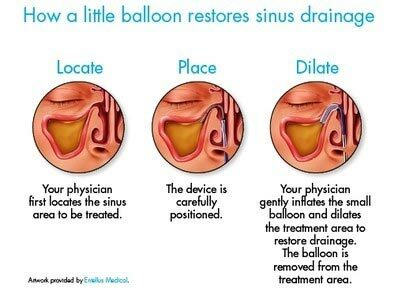 During Balloon Sinuplasty, the Doctor provides a local anesthetic and locates the areas identified in your diagnosis. A small, flexible, balloon catheter is inserted into the nose, and into the sinus openings. When the balloon on the catheter is inflated, it gently restructures and widens the sinus pathway. With the pathway enlarged (dilated), the sinus can once again drain properly. The procedure is quick and typically requires about 30 minutes with the Physician. 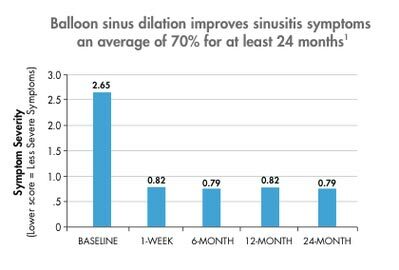 If you have been diagnosed with chronic sinusitis and are not responding well to medications, you may be a candidate for Balloon Sinuplasty. Houston ENT phsyicians can perform your Balloon Sinus Dilation procedure in our offices as an In-Patient procedure. For Balloon Sinuplasty questions, contact Houston Ear Nose and Throat Clinic at 281-649-7000 today to discuss the benefits of relief to Chronic Sinusitis. Request an Appointment with a Houston ENT Doctor to see if Balloon Sinuplasty is an option for you. All of our locations that accommodate the Balloon Sinuplasty procedure including the Katy office.